SimiSodaPop | A Refreshment Of Bubbly Gossip! | Beauty, Fashion, Food and Entertainment: Yes To - Carrots & Blueberries - Products Review Round #2! 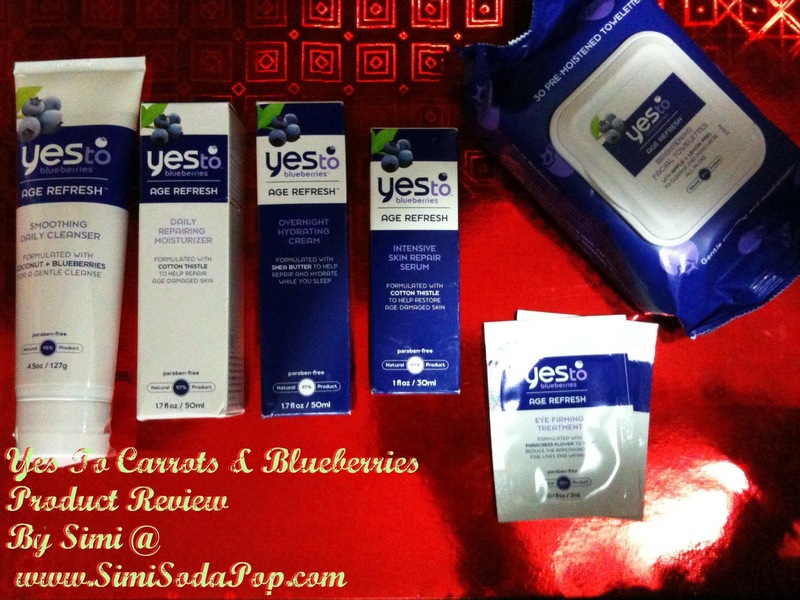 Yes To - Carrots & Blueberries - Products Review Round #2! Here is another review on some products from "Yes To"
I first tried one of these lip butters a few months ago & i fell in love with it! & i was wanting to try more of their scents asap! "Carrot, Berry Citrus. Melon & Mint"
I LOVED all the scents! My favorite was probably Melon! All them smell like fresh fruit which is so nice! These babies make your lips super soft, smooth and leaves the perfect shine! They are USDA Organic Lip Butters & the really condition your lips, leaving them well moisturized & super soft. The Lip Butters contain all natural ingredients & Paraben, Petroleum & Phthalate Free & no animal testing! I really love the packing on these, its so colorful & the scents are all so perfect! These have 6 different colors you can choose from, & I have tried 5 a few months ago & now i recently tried the hard to find best one "Chocolate Kiss"
Its such a great color like chocolate! The Lip Tint's are 95% Organic, NPA Certified & Paraben & Carmine Free. I have been loving to use them under the Lip Butters! If you use the Yes To Carrots Lip Butters & then add your favorite color of the Lip Tints. It looks so pretty & makes your lips look super delicious! I was really excited to try their shampoo & conditioner, but i wasn't that happy over the outcome. They really make your hair soft & smell nice but when this product gets in to your eyes it REALLY burns like no other kind of shampoo & conditioner i have ever tried. It contains Dead Sea Minerals.. so i dont know.. it could be that ingredient that is causing the burning eyes effect. I had a family member try the Blueberries set and same along with my other family member that last tried the blueberries products.. She LOVED it too! The Smoothing Daily Cleanser, Daily Repairing Moisturizer, Overnight Hydrating Cream, Intensive Skin Repair Serum, Eye Firming Treatment & The Super New Brightening Facial Towelettes! My Family member really enjoyed all the products. She noticed a big difference in her skin & it really did a wonderful job! The new facial towelettes are super! They really remove your make well & get all the dirt off your face. Even if you come out of the shower & think your face is clean.. these towelettes will remove what ever you missed cleaning on your face! She Loves the scent of the blueberries products too! She say's it really "BRIGHTENS HER DAY UP!" The scent is really heavenly of all the Blueberries products!! The Eye Firming treatment she would have liked to try more than the 2 little sample packets. It was a nice little sample but not enough to get a good idea of the product. Keep in touch with my site for more reviews featuring products from this brand Yes To!.. Kiss My Face - Products Review Round #1! Who's Leaving Hawaii Five 0? Happy Thursday The 14th of April!! Easter Sky Blue... I love you..
PopChips - REVIEW & CONTEST/GIVEAWAY!